The photos on your old iPod may be the last copy you have if you have lost your Mac. These photos are normally synchronized to you iPod by iTunes in a resolution suitable for the iPod and for viewing on TV. On the iPod they are stored in the ithmb format which is designed for use on the iPod only. Fortunately you can copy the ithmb files from your iPod to your (new) Mac and use File Jucier to extract the images inside. File Jucier convert the images inside the ithmb files to TIFF to preserve all the information from the ithmb files in a lossless manner. First - do not synchronize your (now) empty Photos album with your iPod before you have everything recovered. 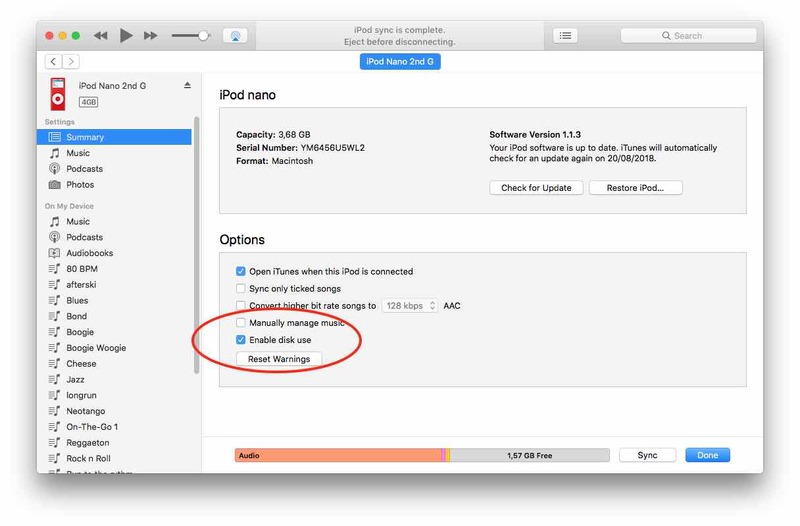 iTunes will warn you if your are about to erase the images on your iPod - click apropriately See screen shot - Do Not Sync!. Use Finder to copy the ithmb files from the "/Photos/Thumbs" folder on your iPod to your hard disk. Convert the ithmb files to TIFF by dropping them into File Juicer. Use the "share" function on your iPod/iphone to email the images to yourself. iPhone/iPod Touch software version 3 let you send 5 photos in each email, but if you have lost you Mac, don't install new software on your iPod until you have the photos in safety. Use a photo sharing app for the purpose. Apple Photos is the obvious choice, but Google Photos and DropBox are too. If you lost the original images, and wish to scale up the rescued photos you can use bicubic resizing in PhotoShop Elements or for better quality ON1 Resize .